there were leaders who saw young people full of potential all across Stellenbosch. Every day they would do their bit to help the kids discover and utilise their potential. Yet they felt alone in their struggle against the lack of opportunities, the hopelessness and the moral degeneration that threaten to steal the futures of the kids they work with. Yesterday I shared with you that most projects contain at least 2 stories: the story of the organisers who dream the dream and put together the project and the story of the target audience for whom they are designing the project. 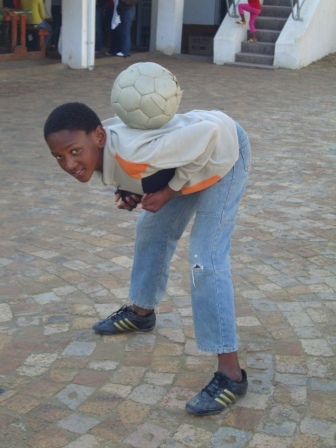 Keep Them Safe is the story of the leaders and adults who embarked on the journey of realising the dream of a holiday programme for kids and young people all across Stellenbosch for the entire 4 week Fifa World Cup tournament. The Perfect Pitch is the story of the kids and young people who sign up for the programme. In real time today 22 June, the stories are both in the Journey stage, but let me tell you more about the Call to Adventure of Story 1 – Keep Them Safe. We issued our Call to Adventure in two main ways from September 2009 to March 2010. First we(and I really mean Henko, the project leader) had one on one coffee conversations with everyone he identified as possible partners – possible heroes for this story. In these meetings they would share their common concerns about the youth – their Ordinary World and the problems they face. Then Henko would introduce his dream… Because of his heartfelt identification with the plight of the prospective hero (being one himself) and his enthusiasm for his dream, the idea spread like wild fire. OF course Henko would never take credit for the idea since it was sparked in him after a conversation he had with people from The Ultimate Goal, the SA Sports Cohalition and the Stellenbosch municipality. Still he saw the opportunity and started to call everyone and any one to join the adventure. The Second way we issued the Call was more formalised. In March 2010 we launched a KTS Taster. The aim of this event was to gather everyone who had had a coffee conversation with Henko or one of the others he had ignited, into one space. We wanted to launch our dream formally and explain it to as many ;people as we could gather. Representatives were brought in from all over the Stelenbosch district and put together in one room to get all the hot coals together and start a bonfire. Yet now everyone had had time to ponder over the project and some concerns, doubts and reservations had begun to surface. We were moving into the next stage of the story: preparing for the journey… I will tell you all about that tomorrow. Who is your target audience/protagonist? Is there more than one? What is their context (Ordinary World) like? What problems do they face that seem insurmountable? What solution can you provide that will speak directly to this need? What once in a life time opportunity can you identify and optimise (The Call)?